Facet syndrome or the facet joint pain | joimax GmBH. In our aging societies back pain disorders are wide spread and common diseases. The differential diagnosis of the facet syndrome (or facet joint pain) is even more common amongst other diagnosed back pain causes. What is a facet syndrome? The facet syndrome is not a clearly defined disease. As the name implies, the symptoms originate in the small intervertebral joints – the facet joints. These facet joints are under constant motion and allow the spine the flexibility and stability that we need to walk, run, bend and so on. They are well nerved and are subject to degenerative processes and therefore an element of the spine, which is probably responsible for much back pain. It is estimated that facet joints are to blame in about 15% of the younger people and in up to 40% of the older patients. What are the causes of a facet syndrome? The facet joints bear a large share of the static load on the spine, but they are subject to even more stress with movements – especially when bending or twisting. There are degenerative processes in the facets similar to those in other joints of the body and therefore osteoarthritis may develop. But not only the result of the natural spinal aging process but also an accidental injury including whiplash or overuse due to – for example – sports or heavy labor already at a younger age can be the initial cause of arthritis or facet syndrome. In addition, the facet joints’ damage may stem also from excessive weight or family history of facet syndrome. What are the symptoms of a facet syndrome? Firstly, you may have a painful feeling in your neck or back that disappears and comes back at each time after overuse. Eventually, in the progress of the disease, the pain lasts longer and comes out more frequently. At first, only one joint may be affected, but if the patient keeps doing his usual activity, after a certain time more facet joints may degenerate as well. A further characteristic symptom of a facet syndrome is dull pain in the lumbar spine, which usually largely varies in its intensity. It may radiate also into the buttocks, the legs, pelvic area, thighs or into the groin. Other symptoms – depending on where the affected joint is located – may include neck pain that radiates into the arms, shoulders or head, frequent headaches at the base of the skull or also weakness in your legs or arms. In general, most patients have persistent point tenderness over the irritated, inflamed facet joints and some degree of loss of flexibility in the spinal muscle. The symptoms, thus, resemble those of a herniated disc. 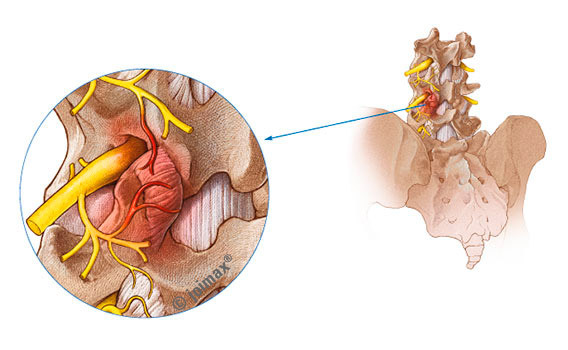 In contrast to the slipped disc, the pain cannot be allocated to a specific nerve root or an associated dermatome. As a result, this is sometimes called “pseudoradicular” pain. How is a facet syndrome treated? Essential to a successful treatment is an accurate expert diagnosis so that the correct source of your pain can be determined. Once the diagnosis is made, in mild cases often a temporary administration of pain medication and a structured and individualized strengthening program will help the patient. If this therapy is not successful, a treatment with minimally invasive procedures can be considered. Here, the pain-causing nerve fibres are either directly flooded with analgesics or completely disrupted with radio frequency.